All transactions are safe and secure with a reliable history in online purchasing behind each of our associates. Buy the What's Up Vanilla Face? t-shirt to own Borat clothing and merchandise. The "What's up vanilla face?" Borat quote has become a Sacha Baron Cohen classic. Borat uses this greeting on a hotel employee when he tries to book a room. 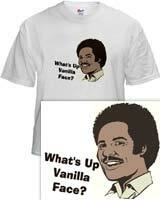 This white Borat t-shirt features an image of a mustached black man next to the greeting, "What's up vanilla face?" This is how Borat was taught to greet a white person in America. Pretend that you hail from Kazakhstan and try it yourself. This hilarious tee looks great with the Borat hat shown at the top of the right column. In addition to the What's Up Vanilla Face? tee above, browse the Borat Clothing Gallery for more apparel like men's and women's clothes, kids shirts or hoodies.